This was my fourth Wine & Dine weekend and runDisney did not disappoint! I did the Two-Course Challenge by running both the 10k and half. But first, the expo. All runDisney expos are held at the ESPN Wide World of Sports Center. 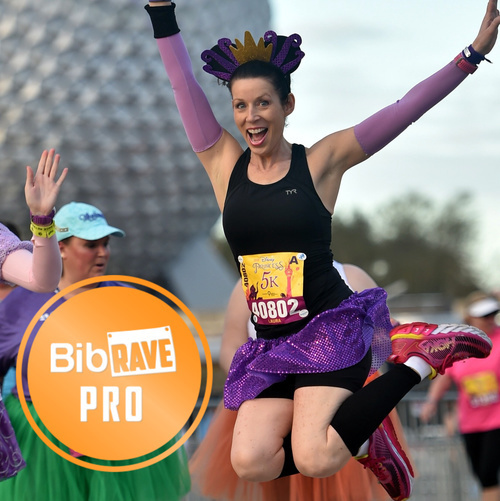 Transportation from Disney World resorts is super easy and they drop you off right by the Arena Building, where they had official runDisney merchandise, commemorative items, bib pick-up, and character photo opportunity with Chef Mickey. Parking is also very easy as well as Uber/driving service drop-off right by the main entrance. There were also many vendors in the Visa building as well as race shirt pick-up. I did have sizing issues with my race shirts, (some were cut smaller,) but I've learned to always check! There is a shirt exchange station, but mine were fine. As for the races, I absolutely loved the pre-race atmosphere! There were four character photo stations flanking the stage where a DJ did an amazing job pumping up the energy and getting folks to dance by showing us the moves. I can't recommend getting to these races EARLY enough! Lines for port-o-pots were long, but that's unavoidable. I do like how they marked out lines with tape in a serpentine pattern, however, and had a volunteer guiding those next in line. (They did the same for the character stops.) Bag drop-off was also super easy. Rudy, Carissa, and John also kept the energy going with great corral send-offs. As for the courses, I can't say that both the 10k and half ones are my favorites compared to other Disney races. You're on the highway quite a bit, but they had a TON of character stops this year! Plus running through Animal Kingdom's Pandora during the half was spectacular. Always a highlight! The race was well-supported with water stations for the 10k and water/Powerade for the half. Sports Beans were given out during the half. There were also tons of Photopass photographers out in the park areas of the course and both finishes were exciting! Plus the medals ... gorgeous! Afterward, they gave out water, Powerade plus a snack box for both races and a banana for the half. There was a lot of congestion in the chute where volunteers handed out the snack boxes, though. runDisney should go back to having tents stations for them. (I'd imagine they will for future races due to the crowding.) They had plenty of banners set up for finishing photos as well as a fun post-race atmosphere with a DJ, character photos, and a tent selling beer, champagne and light snacks. It did rain during the after party but we still had a blast! Lines for some character photos were quite long due to the characters spending too much time interacting with each guest. Us runDisney runners are used to dashing to the character, getting our picture take, and then running off! Very few booths were open but that could have due to the bad weather. Lines near the end for Soarin' were short so we made sure to ride that before leaving! 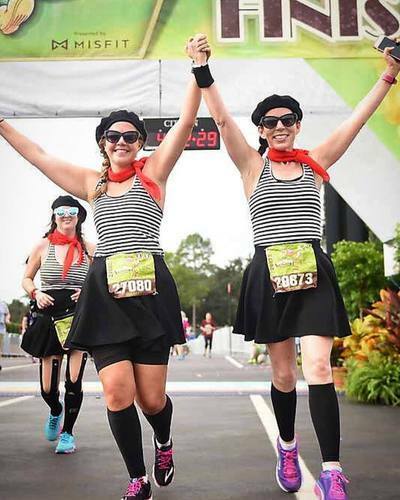 All in all, the Wine & Dine Half Marathon is a blast! There's a great party atmosphere with this weekend plus it's the only runDisney event that offers a free after party to half marathon participants. You also get a $15.00 gift card! If you'd like to learn more, be sure to check out my previous blog recaps and YouTube videos. 2018's are coming soon! "Baltimore Half Marathon: Always a BLAST in Baltimore!" First up, the Expo held at the Convention Center. There was free parking available in certain lots, but we're not very familiar with downtown Baltimore so we pulled in the first parking garage we saw and paid a pretty penny. Live and learn. The expo itself was well-organized in a serpentine design with lots of vendors, freebies, and area for bib/shirt pick-up. We went on Friday night to find no crowds at all! For race morning, we arrived VERY early despite the half marathon 9:30 start. One thing I do want to point out is how there were unofficial parking attendants trying to lure runners into a parking garage for $10.00. Be sure to not fall in that trap since parking is free. I was also disappointed to see that the port-o-pots at the stadium had not been cleaned since the last Raven's game. (My eyes still hurt from the foul things I saw!) This is not the fault of race officials, however. As for the course ... LOVE IT!!!! It's so diverse and you see a ton of Baltimore ... the Maryland Zoo, Patterson Park, Clifton Park, and a spin around Lake Montebello. There are hills a plenty and I mean lots of them so keep that in mind while training. What REALLY makes this race amazing is the spectactors. Oh my gosh, the energy is AMAZING!! Tons of folks out there cheering on the runners with signs, snacks, mimosa and Natty Boh shots. (I did partake ... which I regretted but YOLO.) Many were in costume with music blaring and the finish ... I teared up in the most amazing way! Ending at the Inner Harbor was spectacular although I did miss Camden Yards and M&T Stadium. The race support was also fantastic with stops for gels, chips, bananas, and more. I can't leave out Munchkin Mile where Dunkin Donuts gave out munchkins! The race medal was also fantastic and don't even get me started on the monster-sized King Crab Challenge medal. The sucker is HUGE!!! All in all, I had the most amazing time running the Baltimore Half Marathon. Highly recommend this race. Blog and video recap is coming soon! "Ocean City Half Marathon: Beautiful Beach Run!" I've been wanting to run this race for a long time and finally had my chance this year! And it was on my birthday ... bonus! Starting with the expo, it was easy getting my bib and race shirt, (that ran a tad small,) plus take some fun photos and buy merchandise in a huge tent set up at the inlet parking lot. We did pay for parking but to save money, you can look for spaces along side streets. We then were able to walk to Dough Roller on the boardwalk for some pre-race carb loading! On race morning, my husband dropped us off near Division Street and we walked to the inlet where buses were waiting. Runners were assigned arrival times based off their last names but we were running late due to alarm malfunction. ;) That wasn't a problem, though, and we were soon loaded and driven to the race start at Assateague State Park. Lines for the bathroom were long but once inside, we had a nice break from the morning chill. There were also changing stalls that made getting yourself ready quite nice. Bag check was through open windows of school buses that was quite handy! As for the course, it's flat except for the bridge. I have to say that running on the slightly sloped shoulder of Route 611 wrecked havoc on my knees, enough to say goodbye to my PR goal. Making it to the downtown inlet area put some pep back into my step, though! I absolutely loved running on the Boardwalk and the finish at the Inlet Parking was so much fun! They also had lots of post-race snacks, drinks, a free beer, and lovely race medal. Getting my bag back was also quite easy. All in all, if it weren't for my knee pain, I'd give this race five stars! We will be back next year and plan on taking it easy on Route 611. If you'd like more information, visit my blog post or video recap! "Baltimore 10-Miler: A gem of a race!" But the Baltimore 10-Miler is a lovely race with a semi-challenge course, great scenery and swag plus a killer after party. Rather than an expo, bibs can be picked up at various locations the week prior to the race. (One different location per day.) You can sign up for race day packet pick-up but this option does sell out. On race day, there was plenty of parking but a long walk to the starting area. No biggie, I arrived super early and had plenty of time. As with most races, there were long lines for the port-o-potties, but if you keep walking to the ones on the end, the line is minimal. The course started near Druid Hill Park, goes through some neighborhoods and the Baltimore Zoo, and then loops around Lake Montebello before backtracking to the start. There's not as much crowd support as with the Baltimore Running Festival, but that's okay, once you finish it's a total party with a kicking band, lots of post-race food, and two free beers. The line for race shirts and Baltimore 10-Miler towel, (loved, btw,) was lengthy for a while there, so I'd recommend getting your beers, relaxing, and waiting until the line is minimal. One criticism for the 2018 race was how there were a couple aid stations with no volunteers, leaving runners to fend for themselves and pour their own water. This is a rare oversight, however, since stations in the 2016 were well attended. Plus their was Santa and lots of elves at another water stop that made up for it! All in all, while my personal experience at this race was rough due to nasuea, I love this race. I'm also a big fan of the King Crab Challenge that consists of the Frederick Half Marathon, Baltimore 10-Miler, and Baltimore Running Festival. I also appreciated how race photos were free thanks to Carefirst! If you'd like to see more, visit my blog or YouTube channel for photos and a video recap! "Frederick Half Marathon: Love, love, LOVE!!" As you can tell by my title, I adore this race! It might not be the most elaborate, but it's big on small town charm with stellar support and amazing swag. It's also the first of three races for the King Crab Challenge: Frederick Half, Baltimore 10-Miler, and Baltimore Running Festival. Held at the Frederick Fairground, the expo is fantastic with clear directions, plenty of space, and a fair amount of vendors. I loved the long-sleeve jacket they gave this year! We went Saturday afternoon and were treated to a farmer's market and food vendors as well. For race day, parking is plentiful, but you definitely want to arrive early as traffic can reach Route 70 at times! I arrived early enough to park opposite the fairground entrance which made leaving easier as well. It was easy finding bag check area plus meet up with friends in the stadium. Lines for the port-o-pot weren't bad but since I wanted a real bathroom, I waited a bit for that. As for the course, it's quite lovely, going through historic downtown Frederick, gorgeous developments, and rolling countryside. A priest was out blessing runners as well! For the most part, the roads are flat except for the hill around Mile 11 that smacked me right in the face. I also saw one gal who passed out but a bike medic arrived quickly. The finish is amazing ... you loop around the stadium on the horse racing path and finish in front of the stage with lots of cheering! And the bling! Good grief, that medal was gorgeous with a frame on the back to insert a race photo. They also offered a ton of post-race snacks plus banners were you can get a finish photo. Carefirst also provided free race pictures taken along the course and at the finish that was very appreciated! The after party was a total blast with a kicking band, food tents, and two free beers. All in all, I absolutely love this race and I was thrilled to finish with a 02:03 to use for Disney race proof of time! If you'd like to read my blog post or watch my video recaps, links are below. Thanks for reading and happy running!